When it comes to transport in the city centre the best tip would be: walk or cycle! Although walking trough the streets of Ljubljana often reveals some hidden jewels I’ve never seen before, the bicycle is still my favourite (and the fastest) way of transport. When my PiKolo bike refuses to drive me around due to a flat tire, this city bike Bicike(LJ) is always my first pick to get around the city. 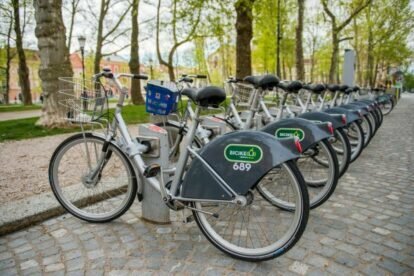 There are 38 stations where you can hire and return a bike, available all around the city (one is right at my doorstep – how convenient, huh!) and are located about 300 to 500 metres apart. The first 60 minutes are free for every first ride, i.e. every time you rent a bike. If you already have your Urbana city card, you can subscribe directly online. You can make an annual registration (if you feel like coming to Ljubljana more often), or weekly registration for short-time visitors. Ljubljana is a bike friendly city and it is pretty flat, so you don’t need to get into your cycling gear to reach the city attractions, nor do you need to feel very fit for it.